It’s a bit of a standing joke that I’m so short that I can fit in children’s clothes. I no longer have my beloved grey kilt style school skirt but I know if I did I could just about still squeeze my child-bearing hips into it. There are tangible benefits to being able to fit into children’s clothes at times. They are cheaper. Not just due to less fabric but there is also no VAT on children’s apparel. Generally if you can fit into clothes made for a ten-year old you will inevitably also have small feet – added benefit of buying children’s shoes. Well OK maybe not shoes, but you’ll save about a tenner on your converse high tops. Buy Large or age 12 boys T-shirts for the perfect fit. Best places to buy Childrenswear: Gap, Adidas. Great for boys T-shirts, shirts. Try M&S for pretty cardigans and good boys shorts. I don’t know about you but I would geniunely wear every piece! Don’t dismiss the menswear department either. Throw a men’s shirt over a floral summer dress or team a mens blazer with some short city shorts and your favourite brogues for a relaxed work look. Leave head to toe menswear to Agnes Deyn and make sure you mix with some girly pieces, even if just a sheer blouse or some feminine jewellery. Best places to buy Menswear: American Apparel, Gap for basic over sized shirts and sweats. H&M and Levi’s mens jeans are always a great fit even on women. It took some nerve. 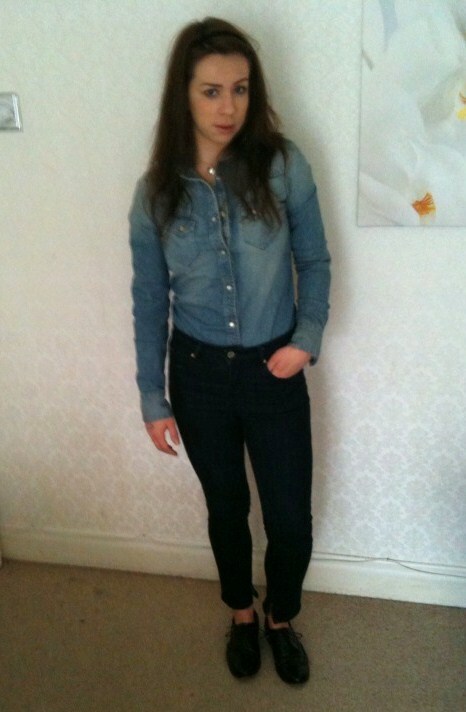 Yesterday, I spent the full day in Double Denim. Gap denim shirt and Topshop dark skinny cropped jeans were chosen as an updated version of the original jacket and jeans combo. And the reaction was divided to say the least. First part of the day was to brave ‘Dress down Friday’ at work. As predicted, I got a lot of ‘Yee Ha Cowgirl’…. Original. Other comments included; ‘unique’ (polite way to say weird?) and one colleague declared that this look was’ not for beginners’. Maybe the brogues didn’t help, but this definitely felt quite a masculine look – and that from someone whom 20% of their wardrobe is menswear. On deciding to venture out after work for a drink in my head to toe denim, I exchanged my black brogues for some tan loafers and threw on a blazer. Comments during the evening were much kinder than those I had experienced so far. Girls seemed to really like the denim shirt, so much so, three asked me where I had bought it from while I was retouching my mascara in the ladies. Most were in agreement that while denim was well and truly back to stay, it is much more accessible worn in just one piece. I have to agree. The Gap denim shirt was a complete success. I’m already unsure how I ever lived without it and can’t wait to throw it over a floral playsuit come spring.